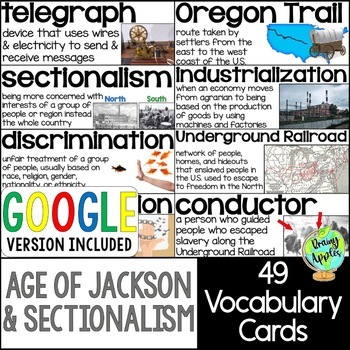 The Age of Jackson & Sectionalism vocabulary/word wall cards. This resource includes 49 vocabulary cards that will enhance any Age of Jackson & Sectionalism unit. It is aligned to my Age of Jackson & Sectionalism Unit Bundle. Every key term that is in the passages is included in this resource. 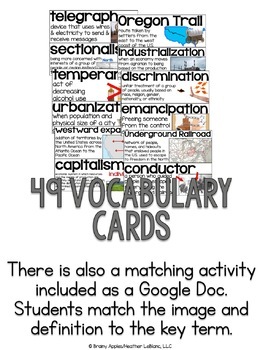 Each card has the key term, a kid-friendly definition, and a visual to help students understand and remember the term. I display the vocabulary card on my board during the unit so I can easily refer to it. Then I place the card on our word wall so students can easily refer back to it the remainder of the year during our other units or when we are reviewing the Age of Jackson & Sectionalism.